Start reading JoJo's Bizarre Adventure: Part 2--Battle Tendency, Vol. 1 on your Kindle in under a minute. 5.0 out of 5 starsNew JoJo, new era, new evil, same old bizarre happenings! JoJo's Bizarre Adventure moves onto a new time and place with the first Volume of Battle Tendency. Succeeding Jonathan Joestar is the young, brash and wily Joseph. Where his forefather was more about honor and being a gentleman, Joseph is more about cunning and thinking three movies ahead of his opponent: "Your next line is..."
The new evil is the "Pillar Men" and their skills and abilities (and philosophies) stand alone from what we have previously read in Phantom Blood. JoJo's Bizarre Adventure has been a main stay, and a content, in the world of Manga for over 30 years. 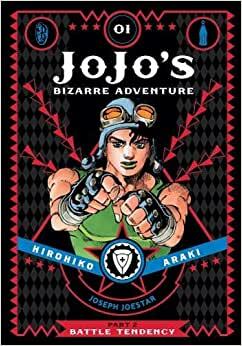 I am glad I stumbled across this series by chance, because I have absolutely loved every moment in this unique and engrossing tale of the Joestar bloodline! 5.0 out of 5 starsFinally! I have been waiting. A great continuation of phantom blood. Still a fun read even for those who have watched the anime. I am glad to finally have it in English and I can't wait for the next volume. Great continuation of the work done on the first three volumes. My only complaint is that this one has only 2 colored pages, and (it feels) not as many reddish pages like the first three volumes, but that might just be me. I'm so happy with it! It goes all the way up to the spaghetti battle if anyone was wondering. The pages are nicely printed of course I like to have a physical copy of things so I recommend buying the hardcover! It's well worth it. I read the whole Jojo series online so if you haven't maybe read it before purchasing it? I really enjoyed Battle Tendency because it's fun, fast paced, and the characters are great! I hope this helps somehow. These books were gifts for my 19 year old son who rarely pulls his face away from a computer screen. He sits and reads these books with great enthusiasm and thoroughly enjoys them.